I've been doing almost zero sewing lately, but I realized I never posted about the project I did last week. We did a secret santa thing in our White Christmas cast, and my person's favorite animal was a goat. 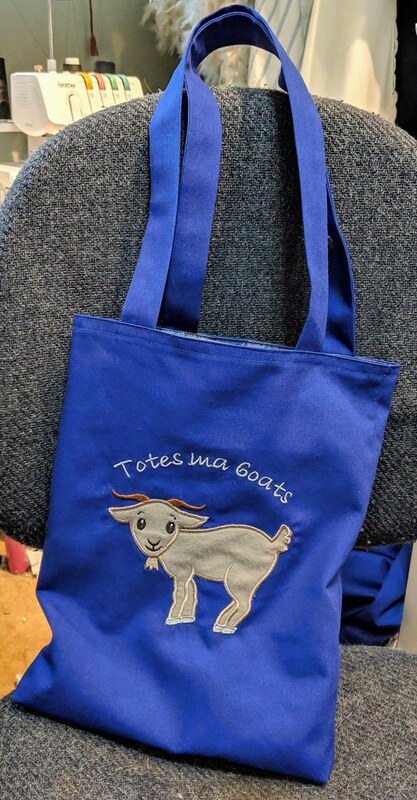 That meant I had a reason to finally make the "totes ma goats" bag I've always wanted to make. It didn't turn out exactly as I wanted - I've always pictured it with the stuffed head of a goat peeking out the front of the bag, but alas, goat stuffed animals are relatively hard to come by, and would have made the bag go over the $15 limit. So embroidery to the rescue! I purchased the embroidery pattern on etsy, but all the fabrics came out of my stash (the outer blue is leftover from the Princess Anna skirt I made a few years ago, the inner taffeta is from my robe a la turque, and the flannel goat applique fabric is from the Thumper stuffed animal I made last year). It turned out a little smaller than I would have liked, but I still think it's cute!